Motor vehicle accidents are often the result of inattentive driving. Recreational vehicle accidents, on the other hand, are more often caused by inexperienced or reckless operation. At Corsiglia McMahon & Allard, L.L.P., our dedicated personal injury lawyers represent clients who have been injured by recreational vehicles. 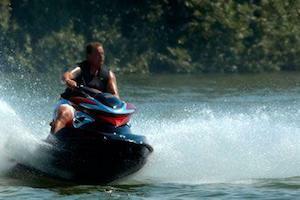 Injured in a Jet Ski, ATV, Wave Runner, or RV Accident? We represent the victims of ATV, Jet Ski, Wave Runner, and RV accidents. In addition, we assist people who are injured by defective or dangerous recreational vehicles. If you have suffered an injury in this type of accident, contact us at (408) 289-1417 to schedule a free initial consultation. You do not pay any attorneys' fees unless we obtain compensation for you. Notable Case Result: $2.5 million settlement for a young child who lost her mother in a car accident caused by a ladder falling from a construction vehicle. The number of people who own or operate an ATVs, Jet Skis, RVs, or other recreational vehicle has risen dramatically in recent years. Sadly, the frequency of serious and fatal accidents has risen along with it. When a recreational vehicle is designed or manufactured in an unsafe manner, the consuming public can be put in danger. Our defective product attorneys help victims of dangerous or malfunctioning recreational vehicles get the compensation they deserve. By holding designers, manufacturers, and retailers accountable for the harm these vehicles cause, we help raise awareness and make the public safer. Many operators do not understand the power and danger posed by the recreational vehicle he or she is driving. Jet Ski injuries caused by watercraft accidents are often the result of an inexperienced operator. Another common concern is the consumption alcohol and use of a personal watercraft. Many fatal accidents result from those negligently operating a recreational vehicle while intoxicated. Whether you were injured by a careless operator or your recreational vehicle malfunctioned causing bodily harm, we can help. Contact us at (408) 289-1417 to schedule a free initial consultation to discuss your case. Our law firm serves clients in San Jose, Santa Clara, Los Gatos, Campbell, Gilroy and other cities throughout the region.